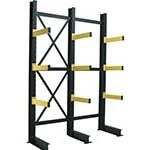 Cantilever Racking is sometimes called bar racks or cantilever arm racks. They are ideal to store medium to very large items horizontally that often vary in width. They can store steel bars, aluminium angles, pipes, timber, or even pallets of plasterboard. As the uprights are an L shape with fixed or adjustable cantilever arms, they are designed to provide clear entry. This leaves the front totally open to accept long loads, such as beams of pipes. The closer the racking uprights, the higher the arm load capacity will be. 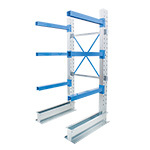 Robust by design, our range of heavy duty cantilever racks are suitable for the storage of very heavy items. 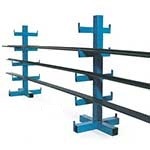 These racking products are suitable for a range of industrial applications from single racks to a large runs up to 10 metres high. To ensure racking is stable, floor fixing is highly recommended. Our cantilever racking systems are well designed to make good use of space and to tore long and heavy items in a safe and accessible way. Depending on the arms length, they are capable of holding a large amount of stock in a relatively small area. Our range of cantilever pallet racking includes both single or double sided, with double sided offering twice as much storage for a smaller increase in footprint. These cantilever racks are often found in builders yards, where they hold the long struts of wood often needed for large scale building work. In addition, they are also common where there is a need to store long lengths of piping or drainage tubing. The secret to how cantilever shelving works is in the distribution of weight. With the large feet at the bottom secured to the floor, this means that loads placed on them will not over balance the bays. 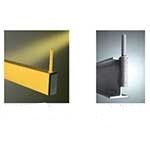 The key feature of cantilever such as these is the absence of any horizontal shelving. Loads are supported by spanning the gap between arms. 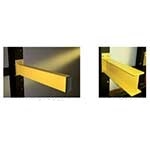 This is why they are only suitable for long items that do not require continuous support along their length. 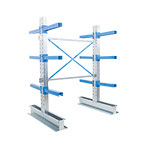 Once your run of racking is in place, extra arms can be purchased in order to increase the storage capacity. However, also note that there will be an upper limit to what weight the bay can hold, so always be aware of total bay load. When loading cantilever racking, always start with the heaviest stock at the bottom, working up to lighter items on the upper levels. This makes it easier and safer to load and unload. 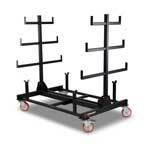 The freestanding fixed arm bar racks are units designed to be accessible from both sides. Resembling a Christmas tree, they have arms on both sides which get shorter as the levels increase. This is designed so that lower levels hold more mass that the upper ones. Racking like this should always be securely fastened to the floor. 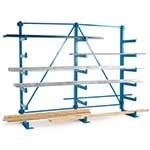 Standard single sided cantilever shelving is designed to be placed against a wall and often should also be wall-fixed in order to give maximum stability. 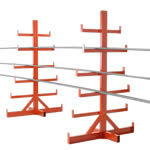 Like most pallet racking, the majority of these products are available as both starter bays or extension bays. Starter bays are self contained with two uprights, whereas an extension bay will need to be attached to an existing bay in order to stand up.